Motion sickness is a condition characterized by uncomfortable sensations of dizziness, nausea, and vomiting that people experience when their sense of balance and equilibrium is disturbed by constant motion. Riding in a car, aboard a ship or boat, or riding on a swing all cause stimulation of the vestibular system and visual stimulation that often lead to discomfort. While motion sickness can be bothersome, it is not a serious illness, and can be prevented. Motion sickness is a common problem, with nearly 80% of the general population suffering from it at one time in their lives. People with migraine headaches or Ménière’s syndrome, however, are more likely than others to have recurrent episodes of motion sickness. Researchers at the Naval Medical Center in San Diego, California, reported in 2003 that 70% of research subjects with severe motion sickness had abnormalities of the vestibular system; these abnormalities are often found in patients diagnosed with migraines or Ménière’s disease. 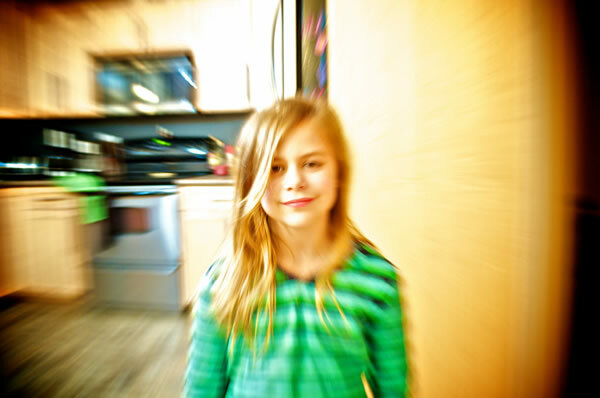 While motion sickness may occur at any age, it is more common in children over the age of two, with the majority outgrowing this susceptibility. When looking at why motion sickness occurs, it is helpful to understand the role of the sensory organs. The sensory organs control a body’s sense of balance by telling the brain what direction the body is pointing, the direction it is moving, and if it is standing still or turning. These messages are relayed by the inner ears (or labyrinth), the eyes, the skin pressure receptors, such as in those in the feet, and the muscle and joint sensory receptors (which track what body parts are moving). The central nervous system (the brain and spinal cord), is responsible for processing all incoming sensory information. Motion sickness and its symptoms surface when conflicting messages are sent to the central nervous system. An example of this is reading a book in the back seat of a moving car. The inner ears and skin receptors sense the motion, but the eyes register only the stationary pages of the book. This conflicting information may cause the usual motion sickness symptoms of dizziness, nausea, and vomiting. While all five of the body’s sensory organs contribute to motion sickness, excess stimulation to the vestibular system within the inner ear (the body’s “balance center”) has been shown to be one of the primary reasons for this condition. Balance problems, or vertigo, are caused by a conflict between what is seen and how the inner ear perceives it, leading to confusion in the brain. This confusion may result in higher heart rates, rapid breathing, nausea, and sweating, along with dizziness and vomiting. There are people who suffer from constant motion sickness. Names for these conditions vary, such as positional dizziness. Pure optokinetic motion sickness is caused solely by visual stimuli; that is, by what is seen. The optokinetic system is the reflex that allows the eyes to move when an object moves. Many people suffer when they view rotating or swaying images, even if they are standing still. Optokinetic motion sickness is of particular concern to the civilian aviation industry as well as to military aerospace programs. In the United States, both the Federal Aviation Agency (FAA) and the National Aeronautics and Space Administration (NASA) have research programs for the prevention and treatment of optokinetic motion sickness. Poor ventilation lowers a person’s threshold for experiencing motion. Anxiety or fear also lowers the threshold. Food. Physicians recommend avoiding heavy meals of spicy or greasy foods before and during a trip. Alcohol. A drink is often thought to help calm the nerves, but in this case it could upset the stomach further. A hangover for the next morning’s trip may also lead to motion sickness. Pregnancy. Susceptibility in women to vomiting during pregnancy appears to be related to motion sickness, although the precise connections are not well understood as of 2004. Genetic factors. Research suggests that some people inherit a predisposition to motion sickness. This predisposition is more marked in some ethnic groups than in others; one study published in 2002 found that persons of Chinese or Japanese ancestry are significantly more vulnerable to motion sickness than persons of British ancestry. Often viewed as a minor annoyance, some travelers are temporarily immobilized by motion sickness, and a few continue to feel its effects for hours and even days after a trip (the “mal d’embarquement” syndrome). For those with constant motion sickness, it may not stop at all. Most cases of motion sickness are mild and self-treatable disorders. If symptoms such as dizziness become chronic, a doctor may be able to help alleviate the discomfort by looking further into a patient’s general health. Questions regarding medications, head injuries, recent infections, and other questions about the ear and neurological system will be asked. An examination of the ears, nose, and throat, as well as tests of nerve and balance function, may also be completed. Severe cases of motion sickness symptoms, and those that become progressively worse, may require additional specific tests. Diagnosis in these situations deserves the attention and care of a doctor with specialized skills in diseases of the ear, nose, throat, equilibrium, and neurological system. Alternative treatments for motion sickness have become widely accepted as a standard means of care. They include herbal therapy, acupressure, and homeopathy. Ginger (Zingiber officinale) in its various forms is often used to calm the stomach, and it is now known that the oils it contains (gingerols and shogaols) appear to relax the intestinal tract in addition to mildly depressing the central nervous system. Some of the most effective forms of ginger include the powdered, encapsulated form; ginger tea prepared from sliced ginger root; or candied pieces. All forms of ginger should be taken on an empty stomach when treating motion sickness. Placing manual pressure on the Neiguan or Pericardium-6 acupuncture point (located about three finger-widths above the wrist on the inner arm), either by acupuncture, acupressure, or a mild, electrical pulse, has shown to be effective against the symptoms of motion sickness. Elastic wristbands sold at most drugstores are also used as a source of relief due to the pressure they place in this area. Pressing the small intestine 17 (just below the earlobes in the indentations behind the jawbone) may also help in the functioning of the ear’s balancing mechanism. 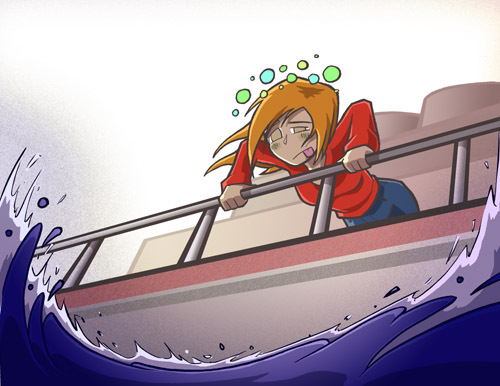 There are several homeopathic remedies that work specifically for motion sickness. They include Cocculus, Petroleum, Ipecacuanha, and Tabacum. In traditional Chinese medicine, cases of chronic motion sickness would be considered a “wind” disorder because it is an abnormality movement as the wind causes. Herbs and acupuncture may treat this. There are a variety of medications to help ease the symptoms of motion sickness, and most of these are available without a prescription. Known as over-the-counter (OTC) medications, it is recommended that these be taken 30-60 minutes before traveling to prevent motion sickness symptoms, as well as during an extended trip. Marezine (and others). Includes the active ingredient cyclizine and is not for use in children under age six years. Benadryl (and others). Includes the active ingredient diphenhydramine and is not for use in children under age six years. Dramamine (and others). Includes the active ingredient dimenhydrinate and is not for use in children under age two years. Bonine (and others). Includes the active ingredient meclizine and is not for use in children under age 12 years. Each of these active ingredients, including such other antiemetics as cinnarizine, are antihistamines whose main side effect is drowsiness. Caution should be used when driving a vehicle or operating machinery, and alcohol should be avoided when taking any drug for motion sickness. Medications for motion sickness may also cause dry mouth and occasional blurred vision. People with emphysema, chronic bronchitis, glaucoma, or difficulty urinating due to an enlarged prostate should not use these drugs unless directed by their physician. The side effects of cinnarizine and the other antihistamine antiemetics indicate that they should not be used by members of flight crews responsible for the control of aircraft or for other tasks that require sustained attention and alertness. Longer trips may require a prescription medication called scopolamine (Transderm Scop). Scopolamine gel is most effective when smeared on the arm or neck and covered with a bandage. In chronic cases, such antiseizure drugs as clonazepam (Klonopin) are used. Another prescription drug that is sometimes given for motion sickness is ondansetron (Zofran), which was originally developed to treat nausea associated with cancer chemotherapy. Unlike cyclizine, ondansetron appears to be safe for use in children under the age of six. Several newer antiemetic medications are under development as of early 2004. The most promising of these newer drugs is a class of compounds known as neurokinin-1 (substance P) antagonists. The neurokinins are being tested for the control of nausea following cancer chemotherapy as well as nausea related to motion sickness. In March 2003 the Food and Drug Administration (FDA) approved the first of this new class of antiemetic drugs. Known as aprepitant, it is sold under the trade name Emend. While there is no cure for motion sickness, its symptoms can be controlled or even prevented. Most people respond successfully to the variety of treatments, or avoid the unpleasant symptoms through prevention methods. Avoiding reading while traveling, and choosing a seat that faces forward. Always riding where the eyes may see the same motion that the body and inner ears feel. Safe positions include the front seat of the car while looking at distant scenery; the deck of a ship where the horizon can be seen; and sitting by the window of an airplane. The least motion on an airplane is in a seat over the wings and the worst is in the tail section. Maintaining a fairly straight-ahead view. Eating a light meal before traveling, or avoiding food altogether. Avoiding conversation with another traveler who is having motion sickness. Taking a motion sickness medication at least 30–60 minutes before travel begins, or as recommended by a physician. Learning to live with the condition. 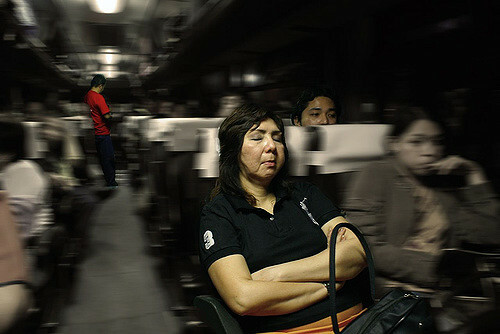 Even those who frequently endure motion sickness can learn to travel by anticipating the conditions of their next trip. Research also suggests that increased exposure to the stimulation that causes motion sickness may help decrease its symptoms on future trips.